Editors Note on Feb 25, 2018: Please see my apology about promoting Alexie's work. When I was at the 2009 Association of College and Research Libraries conference, I saw Sherman Alexie speak, and one of the things that stuck with me is that there's always some truth to a stereotype. He was talking specifically about how the stereotype for many Native Americans is that they are alcoholics. And, in fact, most of his family members are alcoholics. 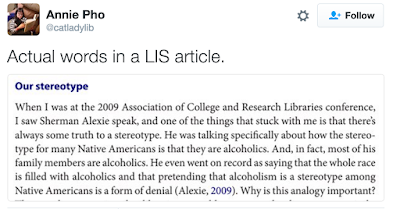 He even went on record as saying that the whole race is filled with alcoholics and that pretending that alcoholism is a stereotype among Native Americans is a form of denial (Alexie, 2009). I took a look at the source for Jennings's quote. 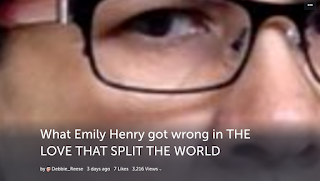 It is a video. I watched it. Alexie did, in fact, say what Jennings says he did. Was it wise for Jennings to use that excerpt in his article about stereotypes of librarians? I think not. Here's why. Most people know what a stereotype of a librarian looks like. They know it is a stereotype, because they know a librarian in real life who is nothing like that stereotype. Most people, however, do not know a Native person. So, there's no way for them--in the course of their everyday life--to know that most of us are not, in fact, alcoholics. 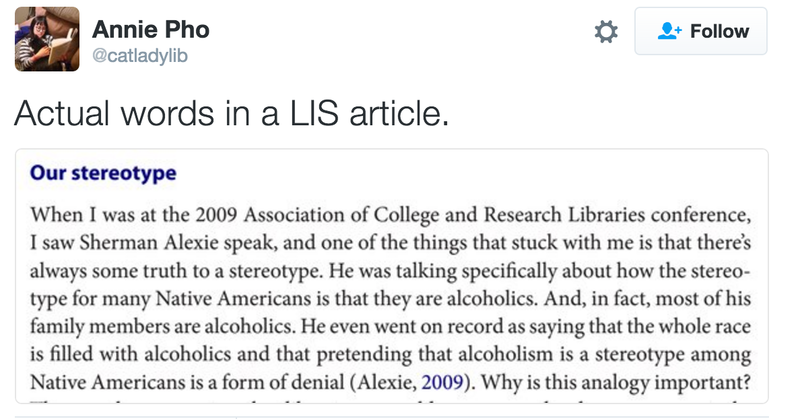 Alexie said it is a stereotype that Native people are alcoholics. The truth? Alcoholism is a widespread disease. Alcoholism is a social disease. It does not exist in higher incidences amongst Native communities. Alexie tells us about his specific family. What he says is not true for every Native family. It is not true for my own family. I'm not saying "Not us" out of a holier-than-thou space. Several years ago, a dear elder in my tribal nation dealt with that very thing. He wasn't well. He had tests done. Based on those test results, his doctors assumed he was alcoholic, and that alcohol abuse was the cause of what they saw in tests. He told them he didn't drink, but, they didn't believe him. Now, he's finally been diagnosed with a fatal disease, unrelated to alcohol. He was telling the truth, but, the doctors did not believe him. Just writing those words brings tears to my eyes. What Alexie says, matters. Words shape what people think and what people do. Words shaped those doctors who didn't believe this elder. I cringed reading Cynthia's words because what she's encountering--like the elder did--is a belief in a stereotype. Those doctors and these librarians think it is real. Others think it is, too. I'm seeing it in books by non-Native writers, a lot. Writers seem to have an idea that, if they're writing a story about Native people or our communities, they better make sure to have an alcoholic in it. Writers who do that are damaging us, and they're damaging non-Native readers, too. They are taking a social illness and making it a NATIVE social illness. My guess is that they have read Alexie's The Absolutely True Diary of a Part Time Indian. That story has alcoholism in it. Because he's got it in his book, I think writers are thinking that they should make sure to include it in their stories, too. Editors: Don't let your writers do that. Book reviewers and bloggers: Your reviews/posts influence purchasing decisions. Pay attention. See what I see, which is the overrepresentation of alcoholism as a part of Native life. Everyone: Read the study. See for yourself. And--read widely. Alexie is one writer. There are others. Don't let him and the stories he tells be the "single story" you know about Native peoples. You can start with Gansworth, Leitich Smith, Edwardson, Erdrich, Tingle, Van Camp, and Taylor. Back in January, a reader wrote to ask me about Emily Henry's The Love that Split the World. I've now gotten a copy, read it, and am working on an in-depth review of it. Due out in 2016, it is being published by Razorbill (Penguin). However! Last week I learned it was being picked up by Lionsgate. If all goes according to plan, it will be a movie. That troubled me deeply because of the errors I found in the book. I started tweeting about it, and got some pretty fierce pushback from people who are friends of the writer. If you're interested in the tweets and my response to the pushback, I created two Storify's about them (Storify is a way to capture a series of tweets in a single place.) I've also got them available as pdf's--let me know by email if you want a copy of the pdf.